Padmaavat, with or without an 'I', is failed flight of a bird with broken wings. It limps, struggles and eventually settles on the ground in an embarrassed shadow of the earlier works of Sanjay Leela Bhansali. Every work of art is the evidence of a tinge of Artist's egotism. Still, the success of a work of art is the ability of the artist to push himself or herself behind the work itself. Bhansali seems to love himself a bit too much to grant the required respect to his own work. He is too charmed by his concept and idea of art and design and in the process kills the primary objective of making a movie- to tell a story. The grand scheme of colors and patterns which Bhansali creates, end up obstructing the story and obscuring the vision of the viewers. This is a movie which it seems tried to carry so many things on its shoulders that somewhere it failed the basic purpose and objective of telling a good story. In the end the movie is a lazy canvass of bright colors, where creativity borders on kitsch and characters become caricature of the people they represent. The movie misses the great efforts made in terms of identifying the language and accents of the times and region which was evident in case of Bajirao Mastaani. The Rajputs keep slipping into poor Urdu and Hindustani at the time and age when Islamic Sultanate was still in the initiation stage in India and any such assimilation of language was unlikely. The only attempt at Linguistic authenticity seems to be splattering of 'pan' (for But)in discourse of Rajput characters in the movie. The makers also seem to be confused on the topic of humanizing Alauddin Khilji. The movie avoids making khilji what he was - A brutal, unscrupulous, religious fanatic, and turns him into so many things which are nothing but the maker's obdurate flight of fancy. Bhansali's Khilji is womanizer, lover, poet, singer, dancer (yes, he knows how to shake his legs) and even some kind of closet PETA activist, who loves his Kebaabs but who loves his birds. Malik Kafur, the noted Military commander and lover of Khilji, speaks in strange accent; he too sings and dances and looks very little like a formidable Military commander who demolished the Deccans. He appears at the beginning of the career of Alauddin Khilji, while he was in fact abducted from rich Khwajas of Cambay by Nusrat Khan and presented to Khilji, much after latter's coronation as the Sultan of Delhi Sultanate (Source: Khajain'ul- Futuh by Amir Khusroe). Deepika is beautiful in parts but is not the face that could launch a thousand ships or bring cavalries to the gates of a formidable fort. Her heavy eyebrows tell no story. Shahid Kapur does not seem to have the presence to match the larger-than-life character of Maharawal Ratan Singh which is supposed to stand up to Khilji. He looks more like a college-kid in a fancy-dress competition facing the imposing persona of a bulked-up Ranveer Singh. One just needs to have a look of the armor of the great Rajput King Maharana Pratap, to understand the giant of a man the Rajput warrior King was and it would have been apt if one had drawn a reference for Raval Ratan Singh from the structure of Rana Pratap while deciding the cast. Shahid Kapur appears too soft, sophisticated and small in stature for a formidable Rajput warrior. The flow of story struggles under heavy, cliché-laden dialogues of the movie. Characters are without nuances and there is little space for gray in the story. When Raja of Mewar is abandoned by fellow Rajputs, MahaRawal Ratan Singh hardly utters a word on the betrayal by fellow Rajputs. One doesn't gets to know the internal struggle of the characters. 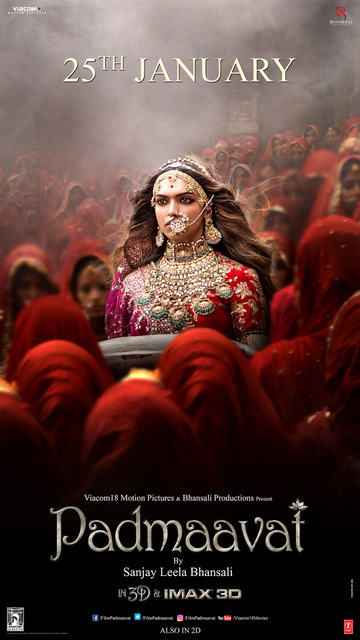 In the end, it appears that the charge of modern-day Rajputs on the Movie for soiling their past reputation is as erroneous as the charge of Swara Bhaskar laced with shocking words, on the film of spoiling the future of feminism. Both give too much credence to a movie which is a lazy and pretentious work of art. It tries to be many things to many people and ends of being nowhere. It is better than Golion ki Raslila- Ramlila but way worse than Bajirao-Mastaani. It is not a movie worth attacking nor is it worth defending. It is a modest movie made at surprisingly high costs. Money seems to have been poured over fancy frames and stupendous sets, but little attention has been given towards writing and research. As I have earlier too written (My Take on Padmavati), a movie is a fictional story not a documentary, which you pay to watch. One has an option to not watch it. If one needs to get offended and take up fights, one needs to chose them wisely, like the history being taught in schools which one needs to mandatorily read. If you have to watch a movie this week, Watch Mukkabaaz - a much better movie.